Phillies catcher Carlos Ruiz knew something was wrong when he woke up one June morning in Los Angeles and his left foot was giving him a little pain. After an exam by the team’s medical staff, it was determined that Ruiz had a mild case of Plantar Fasciitis. No one was too concerned about it – some stretches, a little rest, and he’d be just fine. But last week his pain became so acute that he only played as a pinch-hitter and he did it in sneakers instead of cleats. That’s when he told the Philly sports press that “it felt like a knife in the back of my foot”. Ruiz is no slouch behind the plate or at bat, and considering the injuries the Phillies endured this year, it’s crucial he stay in the lineup. Ruiz is tied for most games played by a catcher and only three others have squatted behind home plate for more innings. He raced through the first half of the season with a .350 batting average and largely avoided the hazards of everyday catching. It’s now clear that what the Phillies’ medical staff perceived as a minor injury has significantly impacted Ruiz’ performance. It’s nothing you should avoid getting checked out, either. 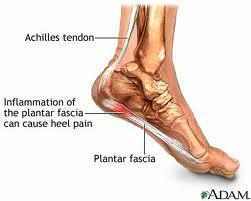 Plantar Fasciitis is a medical term for heel pain. It’s an inflammation of the band of tissue that extends from the heel to the toes and is usually caused by (in this case) overuse, obesity, or bio-mechanical problems with the foot, such as flat feet. Left untreated, plantar fasciitis can become so painful that it’s impossible to walk. It’s important that you have your feet examined as soon as it becomes apparent that rest, ice, and over the counter anti inflammatory medicines like advil or aleve aren’t making it better. Plantar Fasciitis can become a serious condition if ignored. If you’re suffering heel pain of any kind, call the East Penn Foot and Ankle Heel Pain Center and schedule a thorough examination immediately. ← Is the pain from high heels worth the fashion statement?